When I was a kid, Hook was one of my go-to movie choices to watch when I was up all night. (Jumanjiwas the other choice, but that has no merit to my thoughts today, besides letting you know I have awesome taste.) One of the scenes in it was of Captain Hook talking to Peter Banning’s kids, trying to get them to love him instead. As a child, it was just a scene. When I watched the movie as an adult with my own children, the scene hit me in a different way. I found it hilarious, and then I found it sad. I saw that in my children and in myself. The demands, the insistence, the impatience, and the draining nature of kids bothered me. There were two problems with this.How can we change the way kids think? How do we help our children to be thankful? Also, how do we change our thoughts from children being a nuisance to seeing them as the precious gift they are? As parents, we need to instruct them in the way they are to live. They are a blank slate that we write upon. The first thing I did with my children is explain what a helpful heart is. A helpful heart thinks about others first. How can you help mommy or daddy? How can you help your brothers and sisters? How can you help yourself? I tried to show them the moments where they could have a helpful heart. It only took a few days for the kids to catch on and realize how they could have helpful heart. They looked for moments to help out because the extra attention I rained on them was positive reinforcement. They loved to ask, “Mommy, am I a helpful heart?” The interesting thing is that the needs and demands of my children diminished once they were on the lookout for helpful moments. I focused on being thankful for my children. I made sure to thank them each time they had a helpful heart moment. I thanked them for loving me. I thanked them for eating their dinner. I thanked them for doing their school work and having a good attitude. I thanked them for going to bed. I thanked them for everything I could. You know what happened? They started being more thankful as well. 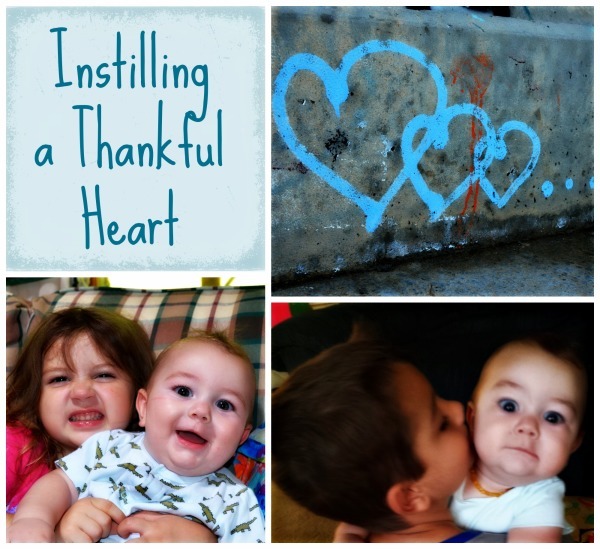 The best way to instill a thankful heart with my children was to sow it in my heart first. By showing them helpful moments and being genuinely thankful for their presence in my life, I learned a bigger lesson than they did. I learned to never take my children for granted and to be truly grateful for my time as their mother.